When did our taste in populist rabble-rousers decline so badly? Or has it? I don’t watch Beck very often, but I catch his act every once in a while, and the thing that always strikes me is how obviously phony it is. This isn’t a subtle thing, either. Every inflection is so plainly calculated that it’s like watching an old-time silent melodrama. Of course, my experience with populist rabble-rousers is slim. Maybe William Jennings Bryan sounded the same way. Ditto for Billy Sunday and Father Coughlin and Joe McCarthy. But I still don’t quite get it. I know that conservatives used to have similar complaints about Bill Clinton’s shows of emotion, which they considered phony. But whether they were or not, he at least made them seem genuine. Beck almost seems to deliberately go out of his way to make his emotions obviously artificial. I dunno. Is this just the standard veneer of revivalist preachers, which I have no experience with? Are there conventions to this kind of thing, the way that opera singers emote conventionally and everybody knows how to interpret it? Or what? I just don’t get who it is who buys this stuff. 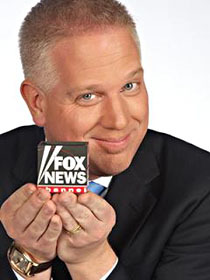 To me, Beck practically seems to be openly mocking his audience.